We all know that the social media world is always changing, and that makes it hard for companies to keep up, even corporate experts. Unlike traditional journalism, social media posts are thrown online before they have gone through editing or approval. This can be dangerous and turn into some embarrassing social media fails and mistakes. Let’s look at some of the biggest hashtag and social fails, and learn from their mistakes. C’mon PR world, you know trying to convince journalists to do something with a hashtag isn’t going to cut it. A PR firm representing this company tried to require them to mention them on social media to get press credentials for the Brit Awards. They wanted journalists to use #pricelesssurprises. Well, MasterCard got a priceless surprise back and not the results they hoped with some angry journalists. Lesson learned: Tread lightly with journalists and traditional news. McDonald’s should know to tread lightly with social media. This resulted in almost all the hashtags being used to bash the new mascot makeover and their food. Maybe they should have kept Ronald looking the same, and spent a little more time on the menu. Lesson learned: Stick to what you know. We all should know this: never delete comments unless absolutely necessary. Smucker’s didn’t like their response on social to their announcement against labeling for GMOS. Their answer to the problem was to delete comments. Anyone should know this is only going to make your already angry audience much more furious. Lesson learned: Respond, don’t delete and know your audience. Cool images don’t always cut it if you don’t consider where they are from. 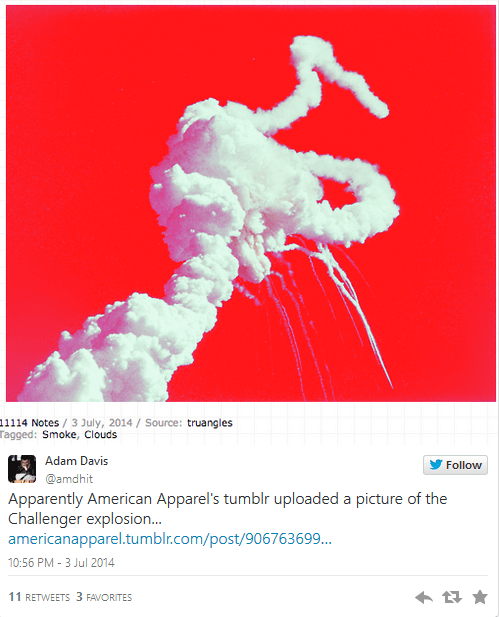 American Apparel posted a fireworks photo on the 4th of July, and it was actually the Challenger space shuttle explosion that killed seven people in 1986. This obviously was an oversight of someone who didn’t know. Lesson Learned: Don’t grab from Google images without knowing where it came from. This one was all about trying to join a trend, but in turn was extremely inappropriate. Following Janay Palmer Rice’s decision to stay with NFL player Ray Rice after a domestic violence instance, the hashtag #WhyIStayed was trending on Twitter. DiGiorno tried to jump into the conversation and tweeted, “ Why I Stayed, You Had Pizza”. Within minutes the tweet was deleted and they had apologized, claiming it didn’t know what the hashtag was about before tweeting. Lesson learned: Know what trending hashtags are about before jumping on board. Take time to research and understand what it really means. Tide joins this list with their hashtag “#cleanwins”. They tried to tie their brand into the NFL season. Unfortunately this hashtag turned into a confusing amount of religious tweets, tweets for natural cleaners instead of tide and some football tweets, none of them really making sense for the brand. Lesson learned: Don’t make your hashtag too vague and think about how it could be used against you. If your brand doesn’t fit with an event, don’t force it. This concludes our journey of some rather prominent hashtag and social media fails. For your own social content, just remember, keep your communication authentic and do your research before jumping on trends.